A few weeks ago I implored the fans of the Philadelphia Eagles to stop celebrating Eagles’ victories by punching police horses. Good news: The Eagles won the Super Bowl and nobody punched a police horse! 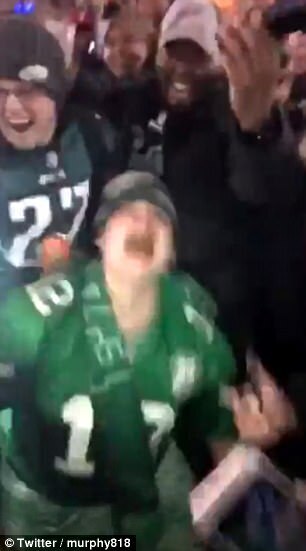 However, one exuberant Eagles fan celebrated by eating horse excrement. Stop and let that sink in for a moment. Randall Cunningham must be so proud his jersey is being worn by such a stalwart of humanity. I apologize heartily for the next photograph. Look how happy everyone is. This made me consider the manner in which I might celebrate a joyous occasion. So I made a list; eating horse excrement off the ground ranked 11,987,344th out of 11,987,345. Using a nail gun to attach my testicles to a telephone pole was the only thing that ranked below it. Hey Philadelphia: this is why you can’t have nice things. I’m not a male but I can guess from how my hubby screams when I kick him in the testicles that it should should rank 1st. The Horse poop is only “Hay & Oats”, served warm! Quit being a woose! If you think horse poop is just hay and oats served served warm, I’d hate to see what you put in oatmeal. To be fair, the only reason they didn’t punch police horses is that none were available; instead, they were tipping police cars and riding a police van. The footage is glorious yet stupid. There’s never a police horse around when you want to punch one. 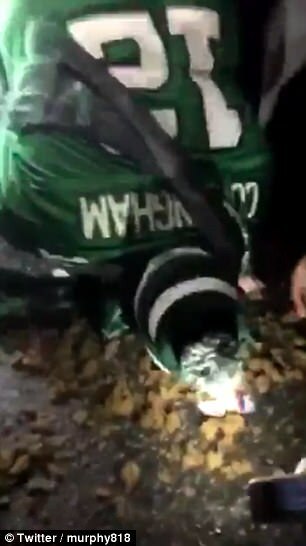 At least the horse was considerate enough to leave the pile of horse crap for any peckish Eagles’ fans.